Comments about Barret from all over the net. The film is well produced and the cast assembled are very believable in their roles, with special kudos going to Barret Oliver for his straightforwardly simple portrayal of a child who is half-human and half-machine. Barret Oliver's performance as Bastian still makes me cry. He speaks to that part of all of us that is not afraid to "do what we dream." Barret Oliver, who plays DARYL, is one of the greatest child actors in my opinion. The film works so well because of the performance of Barret Oliver as D.A.R.Y.L. He gives the presence of the perfect, loving child. These principal roles went to American actors, who are easier to accept as identification figures for teenagers in the States. For shy, timid Bastian the producers found Barret Oliver. Barret is a child-actor, who has already done more than a dozen movies and who often seems to be slightly overacting, but when the shots are developed they come out just right. His strength is an absolutely charming kind of naivete. The brown-eyed Barret Oliver brought such passion and intensity to his gradual involvement in this confused moral fairytale(Neverending Story)-centered on a notably unappetizing Ivory Tower- that him became a hot property from now on. Barret Oliver (Cocoon), as Daryl, is a natural. His deadpan, robotic delivery on lines like, "It's extremely kind of you to be looking after my welfare like this" is cute without being obnoxious, sort of like a junior league Mr. Spock. Barret Oliver, the busiest child actor in movies these days, played the bookworm hero of The NeverEnding Story and the junior scientist in Frankenweenie, and he has a smaller but pivotal role in next week's lavish fantasy, Cocoon. This week he's really tested in D.A.R.Y.L., a likable but weakly plotted science-fiction piece that relies almost entirely on Oliver's ability to suggest the ingenuous nature of a child who's semi-human and semi-machine. He passes with flying colors, even if the movie can't stay away from the anti-government cliches perpetuated by far too many recent sci-fi movies. 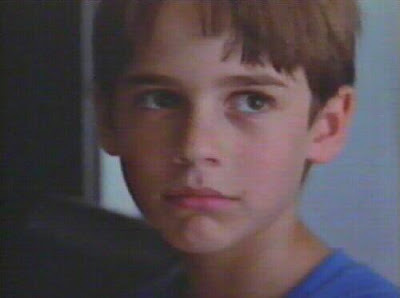 The boy is played by Barret Oliver with an earnest, touching solemnity. Barret was THE child actor of the 1980s and one of my all-time favorites. His sensative portrayal of a child android (years before Haley Joel Osment did it in A.I.) has helped make the film DARYL a classic. Barret Oliver and Noah Hathaway give assured performances as the young heroes. Barret Oliver gives another of his trademark sensitive performances as David (in Cocoon). I think the true hero is Bastian and Barret Oliver have some kind of magic. Barret's natural beauty is beyond description in this film! Oliver as Daryl is the center of almost every scene and he does a creditable job. He's a bit better as Daryl the exceptional child than as Daryl the real boy. But that's just as well, since he doesn't have to act like a real kid too often. The three children actors are utterly outstanding - Noah Hathaway as the heroic and innocent Atreyu, Barret Oliver as the Bastian who manages to be hopeful and despairing at the same time, and the stunning Tami Stronach as the Child-Like Empress, who never fails to make an impression as Atreyu nervously approaches her in the Ivory Tower. Bastian played by Barret Oliver, and Atreyu portrayed by Noah Hathaway. Oliver conveys the meekness that makes his character what he is, and Hathaway provides the strong performance that makes Atreyu everything that Bastian wants to be. 1) How cute was Barret Oliver from let's say: 1980 to 1987? 2) Now compare Barret Oliver to another child star you can find. So who's cuter? 3) Now compare Barret Oliver to youself when you where about 10 years old. Who's cuter? 4) Did Barret Oliver made a successful transition from being cute to being handsome when he reached age 13? It is the age kids become teenagers. I still admire him since I was a kid. Do you? This film is wonderful, I used to watch it like three times a week when I was a child. When you watch that film you see that Barret Oliver(who play Bastian) was truly a great actor and he did some of the most memorable 80s film ever. The only bad thing in this movie is the kid who plays ATREIU. Physically it might be perfect, but sometimes it almost hurts to see him act. Others he´s just fine. It´s a bit strange to watch. Maybe it wasn´t his fault. Anyway, I still think that they should have used the Barret Oliver who plays BASTIAN, because he really can act. Im sure he would be great if he played both parts. Barret Oliver carries the role of the Robot Boy out extremely well - his 'humanness' is excruciating. The one bright spark that lifts the film above the fair-to-average category is the performance of Barret Oliver as the eponymous DARYL. He plays the part with perfection, lending to the character the required nuances of calm observance, awkwardness and stiltedness. He is afterall a robot who observes and copies the behaviour he sees around him and it is Barret Oliver's performance above all else that raises this film from the mundane to the almost (but not quite) sublime. The planned spontaneity of his rebellious temper tantrum at the baseball game is delivered with absolute perfection, at that point and during some of the other scenes, where Barret is given pieces of extended dialogue, Barret isn't acting the part, he IS DARYL. Barret Oliver is so damn cute. The Neverending Story is on foxfam and i am using it as a procrastination tool. (I also mopped the rest of the apartment.) It's such a good, sad, scary movie, especially when you're a kid. Rockbiter is especially tragic. But most of all, Barret Oliver is so damn cute.